The Travelling Lindfields: The Six Essential Rules of Holiday Cycling. 1. What can go wrong will go wrong! This rule is especially true if you decide to fly your bikes. See rule 2. Ooopps! Click here to discover what went wrong. 2. You will need a bike. This rule might be obvious but it is not as easy to follow as you would think. There are varying solutions to the problem of how to source your holiday bike. I think we have tried them all and none of them are fool-proof. Refer here to rule 1, especially if you are foolish enough to fly your bike. Rent a bike at your destination. This works well if you limit your cycling to the occasional half-day here and there, but be warned, renting bikes is expensive. In some places it costs more to rent a bicycle than a car. Start hiring bikes for the whole family and you will quickly find yourself in serious budget-busting territory. We rented these bikes when we cycled The Otago Rail Trail. Take your bikes with you. We live in Australia and often travel in the U.S. For us this solution usually involves flying, specifically, flying bicycles. Be warned, imminent catastrophe stalks anyone foolhardy enough to fly with a bicycle as part of their luggage. Bikes are also big and flying them involves manoeuvring around airports with small mountains of luggage. Very few of our experiences with flying bicycles have ended well. Click here for my post on 'Queenstown and the Flying Bicycles' and here for 'How to turn a Bicycle into a Pretzel'. 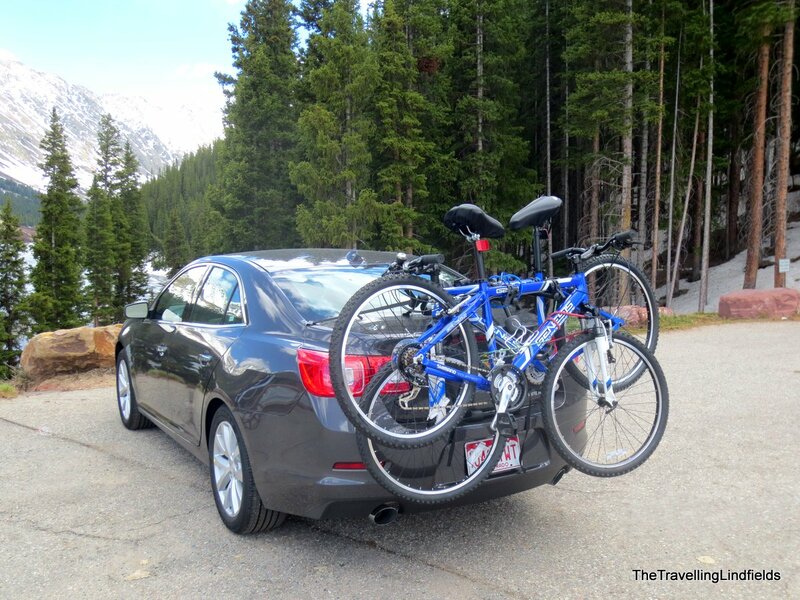 Go somewhere you can drive to and load the bikes on the car. If you think this solution will always work, refer again to rule 1 and read how we completely destroyed David's, almost new, bike on a road trip to Kangaroo Island. The sad story is in my post on 'How to Wreck a Bike'. The irony is that David wanted to fly to Kangaroo Island, but I vetoed the idea because I was concerned about the bikes being damaged by the airline. Stay somewhere which offers free bikes. Just don't do it. 'Free bikes' invariably mean awful bikes, the sort which will put you off cycling forever. 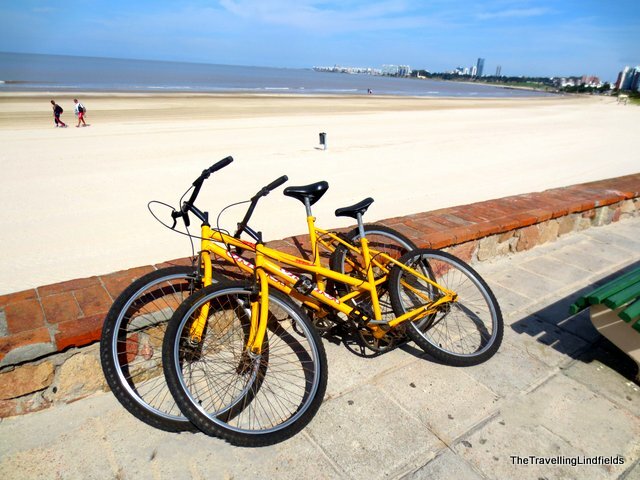 Refer here to my post on Cycling The Rambla in Montevideo on the world's worst free bikes. They look pretty but these were the world's worst free bikes. Click here to read about them. Buy cheap bikes at your destination and give them away at the end of your trip. We have tried this twice. It worked reasonably well the first time. At the beginning of a six-week road trip in the U.S we bought a pair of sparkling new bikes from Walmart. They were about US$200 each. You can read about them in my post 'A Holiday in Walmart - Denver Colorado'. At the end of the trip we gave them to a charity shop. They were in almost new condition and the nice ladies at 'Hospice by the Bay' thrift shop were very happy to receive them. Our 2013 Walmart bikes worked out quite well. Our second experience with buying cheap bikes didn't work out so well. We foolishly imagined that if Walmart in Colorado had perfectly acceptable cheap bikes in 2013, then Walmart in British Colombia would have equally acceptable bikes in 2015. Refer again to rule 1. This time the Walmart bikes were awful. David had done some internet research beforehand and picked out two adult bikes for about US$150 each. When we turned up to buy them we discovered they were so small a vertically-challenged twelve-year-old would have struggled to ride them. We abandoned Walmart and headed over to Canadian Tire where we bought two of the world's worst bicycles. They looked pretty enough and by then we were desperate, but they were just terrible to ride, especially mine. In fact mine literally fell apart on our first cycle and I returned it for a clone of David's which was not only ghastly to ride but also far too big for me. These bikes barely lasted a few weeks, after which we gave them away, gladly, to friends in Seattle. I am not certain our gift of the bikes has completely ruined the friendship but our Seattle friends have been strangely quiet ever since. It must be something about pretty bikes, these Canadian Tire bikes were shockers to ride. 3. You will need somewhere to ride. Forget the idea of riding on roads. One or two close shaves with a sem-trailer and even if you still have all your limbs intact you will be a nervous wreck for the rest of your life. 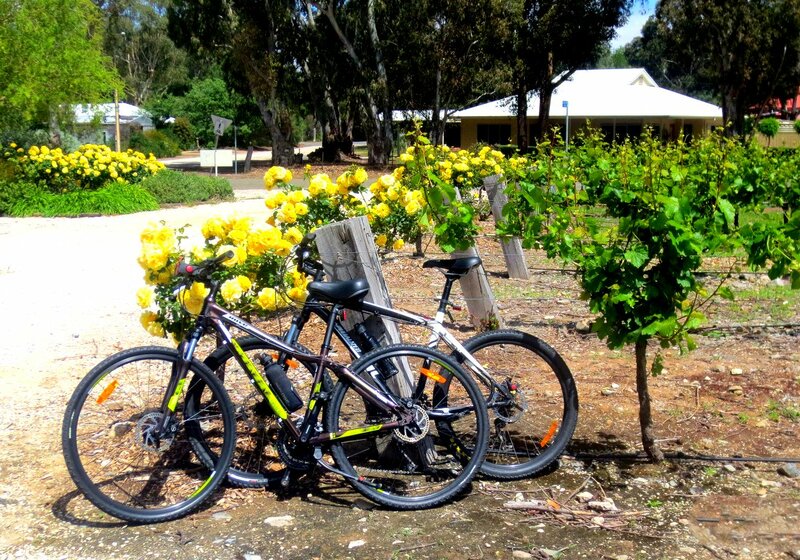 Seek out rail trails and cycle paths. A rail trail is a disused railway which has been turned into a cycling and walking path. Sometimes you can also ride a horse on them and in Canada they turn into snowmobiling trails in winter. The great thing about rail trails is that trains can't go up steep hills, so they are almost always fairly flat. I have an entire section of my blog devoted to the great rail trails and cycle paths we have discovered in Australia, New Zealand and the United States. 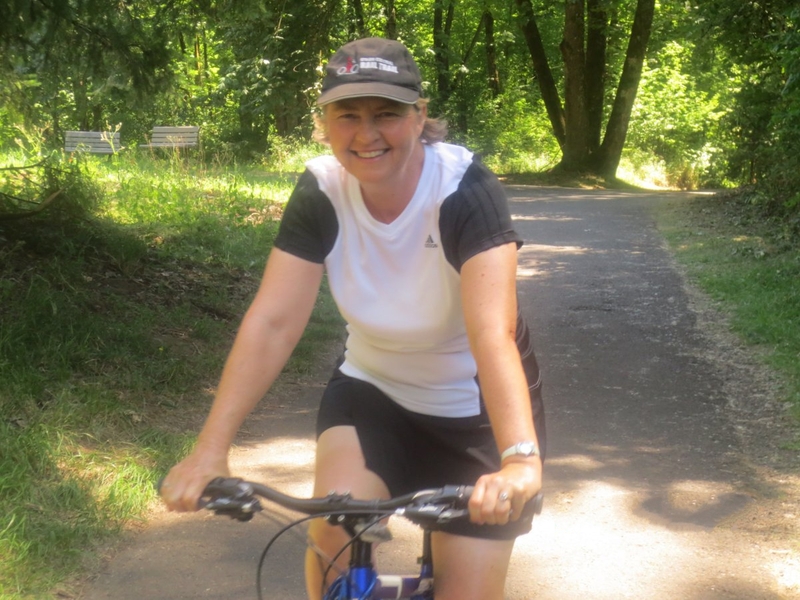 Click the tab heading Bike Paths & Rail Trails to read about them. Find a nice cycle path - they are so much more enjoyable than playing Russian Roulette with traffic. 4. Ride on the right (or the left) depending on where you are. In Australia and New Zealand, we drive on the left-hand side of the road, so that is the side of the path you should cycle on. In the U.S they drive on the right, so cycle on the right. It sounds obvious, but after spending almost twenty hours on an airplane and having your body clock reset by 180 degrees, it is a surprisingly difficult thing to remember to do. To all those nice Americans who I am constantly running into on U.S rail trails because I just cannot get used to cycling on the right - I am really, really sorry. Ride on the same side of the road as you drive. 5. Always start at the bottom of the hill. Consult Google, pick up a topographical map, ask a local, but do whatever it takes to ensure that you start each day at the low point of the trail and cycle to the top. Assuming you need to arrive back at your starting point at the end of the day this will give you a downhill run home.Try it the other way around and you will learn the true meaning of fatigue. Refer to rule 1, which in this case dictates that the wind will always be against you on the way home and if you are going to get hit by a storm, that is when it will happen. Rain, wind and slogging uphill does tend to take the gloss off a nice day's cycling. In all our years of cycling, I think, we have only once had the wind at our backs on the way home - and it was pure bliss. You can read about it in my blog post 'Cycling at Redcliffe'. If you are racing to get home ahead of a storm you really don't want to be cycling uphill! 6. Always take your own lunch. It is a truth, universally acknowledged, that you will pass many lovely little cafes, pubs and restaurants when you are out holiday cycling. However, you will only ever pass the aforementioned beautiful places to eat when you have first, spent several hungry hours searching for somewhere to have lunch and second, just settled for greasy fish and chips at the ghastly take-away 100 yards up the road. The cycling world is full of lovely little cafes to stop for lunch but you will only find one when you have given up in despair and had greasy fish and chips from the horrible take-away around the corner. Good luck with the cycling! If you have any questions I would be delighted to answer them. We're contemplating a week-long cycling trip in France, and it is hard to decide whether to rent, bring our own bikes or buy a cheap one over there. No easy answer! I know what you mean. If you are just going for a week I would look at renting. David and I would love to do some cycling in Europe but the whole 'how do we source our bikes' thing is putting us off the idea. Most of my cycling holidays have been ones by specialist outfits which include bike hire and luggage transfers. This has saved many of the problems listed above, even if the first few miles always involve things like adjusting the saddle height to get it quite right. Family circumstances mean that these days I tend to stay close to home, taking short breaks in East Anglia organized by Cycle Breaks, but they also organize or subcontract tours in various places in Europe. Previously, I have used Belle France, who either have had agents in place or have subcontracted to similar local outfits. On my experience, I would recommend either of them. I would second the "pack some lunch" advice, recalling one day when every pub I passed was either closed for change of management, closed for private function, closed for renovation, no longer trading, or simply not serving food. Also, in warm weather, about 5l of hydration per person -- nothing takes the fun out of a ride more than being parched during the afternoon leg. You are right about the need to take plenty of water. It is so obvious when you cycle regularly but easy to overlook when you don't have a lot of experience. Tours definitely have one big down-side compared with day-trips out from a single centre -- the weather just doesn't care that you need to get from hotel A to hotel B that's 50km away today. That said, I can only remember a handful of spectacular drenchings over the last 20+ years, and most of the times I've taken a single centre option as a precaution against bad weather, my pessimism has not been warranted. Another objection might be to committing to a relentless "cycle every day" grind. That might be the case for short (3 day) breaks, but the longer ones I've done have all included rest days (with optional circular rides for the enthusiastic sorts, like myself) -- take for example the Niort to La Rochelle tour I did in May '04 (http://stevegilham.blogspot.co.uk/2004/05/niort-place-has-cinema-multiplex.html + subsequent days -- one of the times I did get wet) and again in May '05 (also blogged), where there were only two days of necessary cycling out of five days "on the ground". The up-side is that with a linear tour you can indulge in routes that are on average downhill all the way; both the tour above, and the Canal du Midi ride I did in August '06 start inland, and gently proceed to the sea. The rain and the day after day relentless riding are two of the things which turn David, my husband, off most. When we cycled the Otago Rail Trail we met the same groups of people several times. It was great fun and there was a real camaradarie. They all thought we were mad having a car as well and therefore cycling every stretch both ways, but one day it rained all day. They had to keep going and it did not look like fun. We took the day off, slept in, and went for a drive in the countryside. We have not been to Europe for about ten years. We have had to stay connected to Australian business hours and the time-zone in Europe is awful for that. However, that may be about to change. We are in the early stages of planning a European holiday for 2017 maybe 2018. I'm going to have a look at your blog on the tours you mention. Any other suggestions on bike tours will be gratefully received. David loves pretty countryside so if I can find a bike tour pretty enough I might be able to persuade him to give one a go. I love the idea of going downhill the whole way! Great humorous tips Lyn. A point to those foolhardys who still want to fly with their bike. 1. You will have to either take your own bike case or purchase a bike box from the airline. 2. Take a spanner as you have to loosen the handle bars to twist into the box and often also remove a peddle. 3. Pack a bike pump as the tyres have to be deflated due to the changes in air pressure. You sound like someone with experience of flying bicycles. I may, one day, do an entire post on how to fly bicycles but I will need a few stiff scotches to calm me down first - just thinking about it makes me feel stressed - lol. You are right about the boxes and the spanner. We have two bike bags which work reasonably well but provide almost no protection against damage by baggage handlers. The problem with boxes is, what do you do with them when you arrive at your destination, assuming you need them again to fly home. The spanner is essential but you have to remember not to pack it in your hand luggage. David has had an allen key confiscated at the airport on the basis that it could have been used to dismantle the plane - mid-flight! If an allen key could cause such havoc imagine what one might do with malicious intent and a spanner. We have never deflated our bike tyres. I always thought that was just so they would fit in the box. Maybe that is where we have been going wrong all these years - lol. Sometimes the most obvious things are the easiest to overlook, but cycle up enough hills on the way home and you learn to appreciate the value of a topographical map. This looks like so much fun and I had a good time visiting Lyn, thank you. Great post! I'm please you enjoyed the post. Lyn, Great tips. I really want to get back to Australia and try some of your routes out. There are fantastic cycle paths in the US as well, and no doubt, in Europe. Your style of traveling reminds me a lot of another friend of mine, also an Australian like you, who runs a great travel blog (Aussie in France). I am sure biking is a great way of enjoying nature and covering a lot of territory when you travel, but for me it doesn't look like fun. It would be difficult to carry my heavy camera and all the other small things that you usually store in the trunk of a car. Besides, having a flat tire and getting dirty to change it why I have different travel objectives, would really ruin my day. I think you are much more of a photographer than me, and certainly a much better one. I just carry a tiny little point and shoot, take tons of photos, and usually find at least some of them come out well enough for my blog. I love photography but I think I am probably a writer first and a photographer second. As to flat tyres, I have a confession to make. I haven't changed one since I was a child. David is a true gentleman in that regard and always insists on changing my flats for me. It is still a hassle though and the least fun thing about cycling. We always have a car as well so I still get to use the boot of the car for all the holiday junk. The tricky part is fitting it back into our suitcases for the flights home! I'm off now to have a read of 'Aussie in France'. These are all very good tips, Lyn. We usually go windsurfing on every vacation, so naturally the thought occurred to take our own equipment, but so far we did not, but rather went to places we could rent. Windsurfing looks like so much fun but I have never tried it. We see windsurfers all the time in Australia when we are cycling - we do a lot of cycling by the sea. Carrying a couple of windsurfers around would be even more difficult than carrying bikes so I can see why you rent them. Wow, that's a lot of information to get one started. I never really thought about exploring a place by bike, but I agree it does have a lot of advantages. In Central Europe literally everyone is on a bike and it's a common mode of transport. I used to cycle everywhere. Thanks for putting this info together. If you can get away from busy roads, exploring places by bike is so much better than driving (too fast) or walking (too slow). 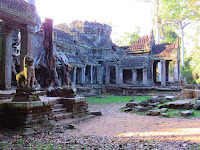 As I love bicycling when I travel this was a great post. I've never shipped my bike because it seemed like too much trouble. I guess buying a bike seemed like a good idea at first. Too bad about your experience in BC. For me, I'd be renting, but as you say, sometimes it can be really expensive. I totally agree about packing one's lunch or at least a snack. Never know when a cafe might appear. Renting doesn't work well for us because we usually travel for five or six weeks, but if you are only going to be somewhere for a week or so it is probably the best option. What great tips for new-cyclists! The most intimidating thing for me would be adjusting to the other side of the road! Haha - you have zeroed in on my main problem. Of course we go away for so long and so often that then I struggled to adjust back to the Australian side of the ride. Great ideas. We always carry ours with us when we travel in our motorhome, but they are usually fairly easy to find for rent when we fly. We have friends who travel with their motorhome - as in ship it to whatever country they are visiting. It works for them and they just put the bikes inside but I think the stress of worrying about all the things which could go wrong would just about kill me. Renting bikes is easy if you want them for a day or two but we usually want them for weeks on end and we don't always end up in the same place we started. As keen cyclists, we can totally relate to this post! I love your point about taking a packed lunch because you will definitely eat the greasiest most horrible fish and chips just before coming upon a gorgeous, quirky little cafe with top food. Great tip about buying bikes when you get there and giving them away afterwards. Hi Jo. Your Gravatar has shown up in your second comment. Honestly, I think we could all go mad trying to work out why these glitches occur. I'm glad you can relate to my cycling post. The lunch tip comes from many, many years of disappointing lunch experiences. This advice is right up my alley! I can't wait to see what you'll share from your sporty adventures collection for the themed post next week!! And don't worry, all the nice Americans forgive you for the riding on the left. It's only the cranky ones you have to worry about. ;) Thanks for linking up! I am so glad you are enjoying my posts. Sadly, life has got in the way a bit this week and I am not sure I can manage to publish a new post - but I will be back next week with something cycling related. Do you mean the free bike rental schemes that a lot of cities now have. I think they are fantastic but while the bikes are great for short rides they are often too heavy and cumbersome for longer cycles. I haven't seen the schemes in Europe but we have them in Australia and I have seen quite a few throughout the U.S.
Love cycling - your photos are just beautiful and inspire me to get fit! Aren't you in Singapore right now? Hire a couple of bikes and cycle along the water with Explorason. I am fairly sure you can hire bikes at East Coast Park.